While quality is important with any flexographic printing plate,nowhere is it more critical than when making printing plates for pharmaceutical blisters and medical packaging. Quint Company has been a pioneer in the use of bar codes on pharmaceutical packaging.With 30 years of experience and specialized expertise, the company sets the industry standard with virtually error-free plates and grade “A” ANSI bar codes. 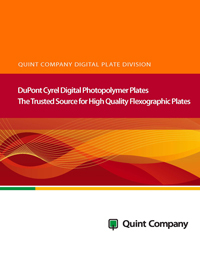 Unlike most,if not all,of our competitors, Quint Company has developed and adheres to proprietary systems and processes for making flexographic plates. These systems and processes meet cGMP requirements and typically exceed audit requirements. In the pharmaceutical industry in particular, clients benefit from a deeper understanding of the platemaking process.We take the time to share with clients exactly what can go wrong and why and, more importantly, the requirements for getting it right. Delivering as promised and providing excellent customer service. Whether responding to a quick request or addressing a large, long-term project, the Quint Company team delivers on time and on budget andwith a pleasant, customer-driven approach.